Crock Pot Raspberry Chocolate Lava Cake - Recipes That Crock! 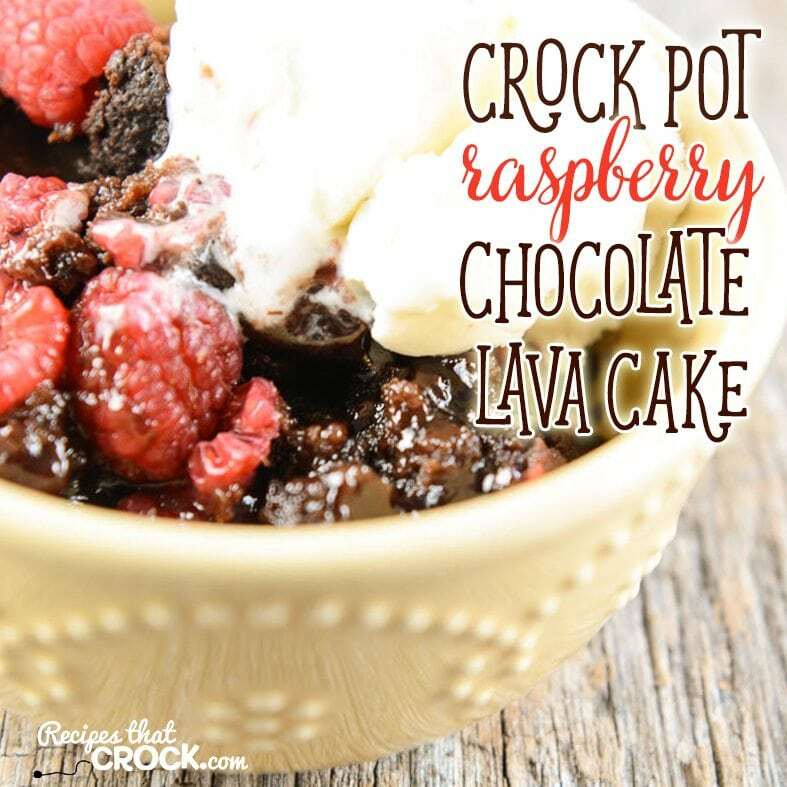 Crock Pot Raspberry Chocolate Lava Cake is the perfect slow cooker spoon cake. Deliciously rich chocolate cake infused with sweet raspberry “lava” is so good you won’t believe how simple it is to make! Now updated with a video from Mikey. 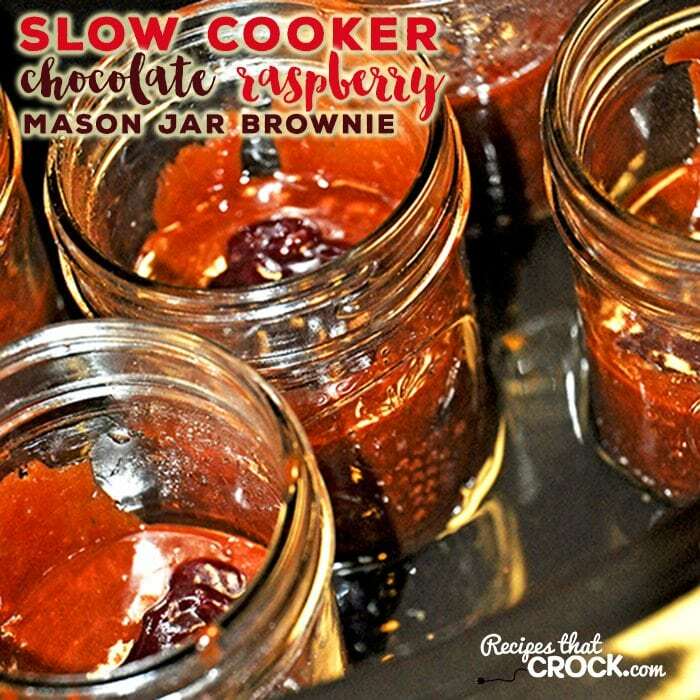 This ah-mazing Crock Pot Raspberry Chocolate Lava Cake is an adaptation of one of my very favorite chocolate recipes of all time– Chocolate Raspberry Mason Jar Brownies from Gooseberry Patch’s Slow-Cooker Recipes Cookbook. I have always loved the flavor of those brownies so when I was trying to think through a cake I could make Mikey for his birthday I began thinking that these yummy brownies would make an amazing spoon cake with the raspberry jam serving as a delicious lava sauce throughout the cake. To say this way a HUGE success would be a BIG understatement. It was INCREDIBLE. We served it warm with vanilla ice cream and it was absolute perfection. We crocked this up in our 2.5 quart mini casserole crock pot. We used raspberries and raspberry jam, but I bet strawberry would be really good too. Your “cake” is going to be a spoonable consistency when it is finished like most lava cakes. The “lava” in this cake is your jam. Be careful when spooning it out because it will be hot as lava! 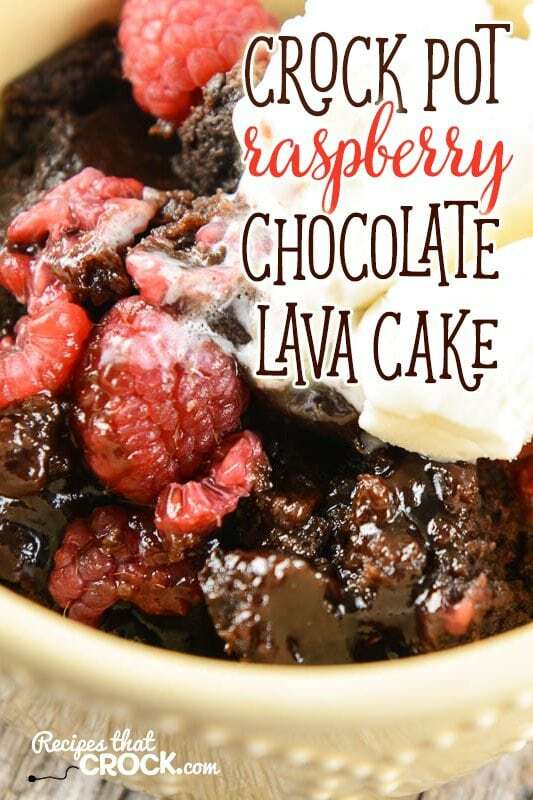 Crock Pot Raspberry Chocolate Lava Cake is the perfect slow cooker spoon cake. Deliciously rich chocolate cake infused with sweet raspberry "lava" is so good you won't believe how simple it is to make! Then remove from heat and stir in sugar, ⅓ cup of jam, vanilla and eggs. Next add flour and baking powder and combine well. Lastly, dot remaining teaspoonfuls of jam evenly across the cake. Cover and cook on high for 2-3 hours or until the cake it set. It will be a spoonable consistency. Serve warm with fresh raspberries and ice cream or whipped cream. Could I double the recipe and use my larger Casserole Crockpot? I would recommend using a 6 quart slow cooker if you plan on doubling the recipe. I think it would probably set up better in a larger crock. However if you don’t have one and need to use the casserole crock, it would probably do okay. If you have trouble getting the middle to set up, I’d just remove the lid at the end and finish cooking until it sets. I would also highly recommend cooking with a paper towel under the casserole crock lid because mind catches a lot of condensation during cooking and you don’t want that getting on your cake. Enjoy! This sounds truly delicious. I was wondering if you think I could double the recipe and use a 5-6 quart crockpot. I am looking for a dessert for a family gathering. Do you think the cooking time would be the same? I think it will do fine in a 6 quart if you double it. It may take a little longer, but I wouldn’t think much longer. It is a spoonable cake in the end, so it just needs to set up to be ready to eat. Enjoy! Actually i’m not replying to just one recipe, but many. I truly love all your recipe, and also love watching you put them together. I’ve made copies of many to give to my young grand daughter who is learning to cook. Plus I bought her a crock pot to make cooking easy. She works 8 hrs. every day, so crock pot cooking is ideal . Thank you for all these wonderful recipes. I’m 80 yrs. old, this would have been a Godsend for me when I was young and learning to cook. Unfortunately , no computer, or Crockpot! Thank you so much for this note! Readers like you and your granddaughter are why we do what we do.